The South African Portuguese Chamber of Commerce (SAPCC) and Câmara de Comércio e Indústria Luso Sul-africana (CCILSA) have agreed to strengthen ties and work together in areas of common interests for the benefit of their respective members. Newly elected President of CCILSA, Tim Vieira and local representatives met with the SAPCC board to establish agreement on collaboration between the two chambers. Communication and cooperation strategies will bring the two chambers closer and will expand and strengthen the deliverables offered to members and stakeholders. This is a big step forward in the process of building a stable and fruitful relationship between the chambers of commerce. With SAPCC based in Johannesburg and CCILSA based in Lisbon, this collaboration unlocks the network and promotion of opportunities for the chambers’ respective members. 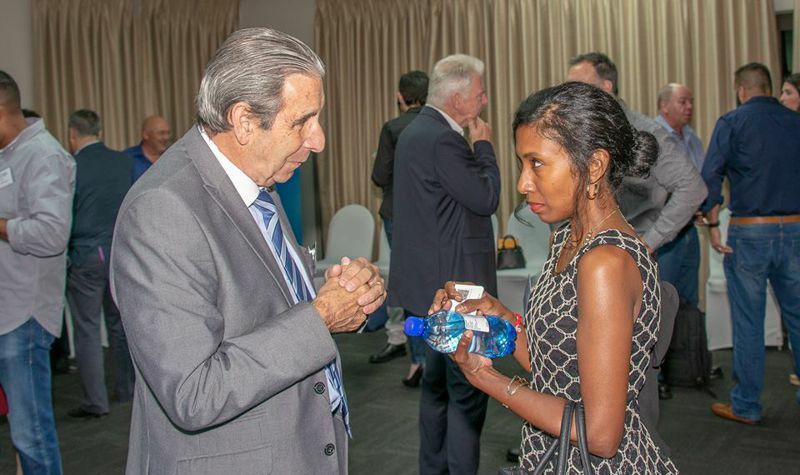 On the 21st February 2019 at the Royal Johannesburg and Kensington Golf Club, Johannesburg, the SAPCC hosted a Speed Networking Event in collaboration with Standard Bank. This annual event on the SAPCC events’ calendar is always a firm favourite amongst our members where participants get to directly network and promote their businesses at speed. The event was well attended with approximately 75 participants. Tony de Gouveia welcomed everyone on behalf of the Portuguese Chamber and introduced his co-facilitator Mark Peters. The facilitator, Mark Peters gave some valuable tips and guidelines on networking and how to get the best out of the event. The format of the event was fast paced and structured to allow participants to interact with each other for 5 minutes on a rotation basis. This was tightly controlled by Tony and his bell. The event was fun, exciting and an effective way to make a lot of initial connections in a very different environment from the standard business networking meetings. The feedback from the participants was overwhelming and the organisers were encouraged to repeat the event in future. Sofia Pone and Zita Duarte then distributed the SAPCC membership certificates to those members who recently joined the Chamber. Thank you to our sponsor Standard Bank. Thank you Tony de Gouveia, Mark Peters and our photographer Nuno Simoes. Thank you to O Seculo for covering the event and for their continuous support. **For more see article by Alice da Silva in the SAPCC Feb Newsletter. The Wanderers Club in Johannesburg played host to SAPCC's 5th Anniversary Gala Dinner and Standard Bank Business Excellence Awards on Saturday, 28th July 2018. The Awards are held annually to recognize and celebrate outstanding success and excellence by Luso-South African businesses and individuals contributing to the economic vitality and social fabric of South Africa.